It can be frustrating and stressful dealing with a fearful dog. Our dogs should not have to be fearful of anything. We are here to protect them and tell them what is safe and not safe. When dogs are being fearful and stressed, it’s unnatural. Animals by default are peaceful, calm and content. Imagine deer, cows and bunny rabbits grazing in a field. That is the natural, calm, serene state in which all animals thrive. You don’t see constantly “over-excited” cows or deer. The only time animals do tense up is when there is a life-threatening predator in their midst. If your dog is getting tense or excited, it’s like he is living in or reacting with that kind of adrenaline rush. This is obviously not good for him, nor does it make him happy and content. In nature, there usually is one leader that is in charge of a herd, flock, pack, etc. who is the “lookout” and who is responsible for alerting everyone of danger so they can all relax. That can and should be your job. All that aside, there are important issues as to what can happen to fearful dogs. Fear usually turns to aggression at some point because these emotions/reactions are VERY closely related (fight/flight syndrome). Therefore, fearful dogs often end up biting in reaction to their emotion. You want your dog to like new people and other dogs – not dread them or fear them. And you certainly do not want him to bite them! Also note that puppies under 18 months usually demonstrate only fear and, it is around this age in a dog’s development in which fear turns to aggression. So please work with your fearful young dog before she makes the switch. Another issue with a human-fearful dog is that, if she gets loose, no one can catch her because she doesn’t trust strangers and will run away. And, of course, she can run into danger (e.g. traffic) as well. Therefore, we always recommend working with fearful dogs to build their confidence and trust, and to calm them down. So naturally, we, as owners feel badly for our dogs when they are frightened or nervous. We often react by coddling the dog and feeding into the negative energy surging through them. This, ironically, usually just makes the situation worse! We need to show strength and help our dog gain confidence. If we get nervous along with our dog, of course he will stayed locked into his fearful state. Or, if we get angry at his barking, of course he will remain agitated. This creates a cycle where we are anticipating our dog’s reaction and getting almost as upset as he is! Without outside help, it’s often very hard to break this cycle. By building your dog’s confidence back up and (re)introducing the things she’s scared of in a safe, positive context, she can learn to overcome her fears and become more calm and happy. 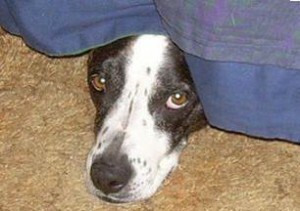 We are the SF Bay Area’s experts with helping fearful and aggressive dogs. Schedule an appointment today!